Encounters are durational, improvised, action/time/space-based performances inhabiting private studios, art venues, and public spaces across the city. For this festival, Los Angeles artists were joined by international guests from Latin America and Europe for two durational performances: one indoors, and one outdoors. Performed by John Burtle, Mariel Carranza, Rochelle Fabb, Douglas Green, Rebeca Hernandez, Benjamin Jarrett, Carol McDowell, Lala Nomada, Paul Outlaw, Graciela Ovejero Postigo, Crystal Sepúlveda, Cecilia Stelini, Rossen Ventislavov, and Allison Wyper. Presented by Pacific Standard Time Festival: Live Art LA/LA, these Encounters were supported by Human Resources Los Angeles and a Foundation for Contemporary Arts Emergency Grant. Production Management by Rhizomatic Arts. Photo by by Marcus Kuiland-Nazario. 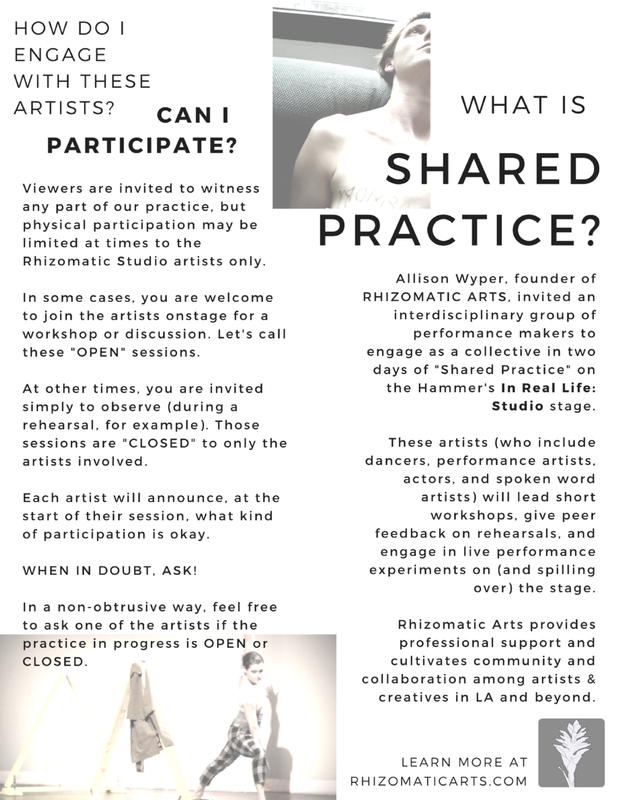 In November 2016, Rhizomatic Studio convened an interdisciplinary group of leading Los Angeles performance makers, who engaged collectively in two days of "Shared Practice" at the Hammer Museum as part of In Real Life: Studio. 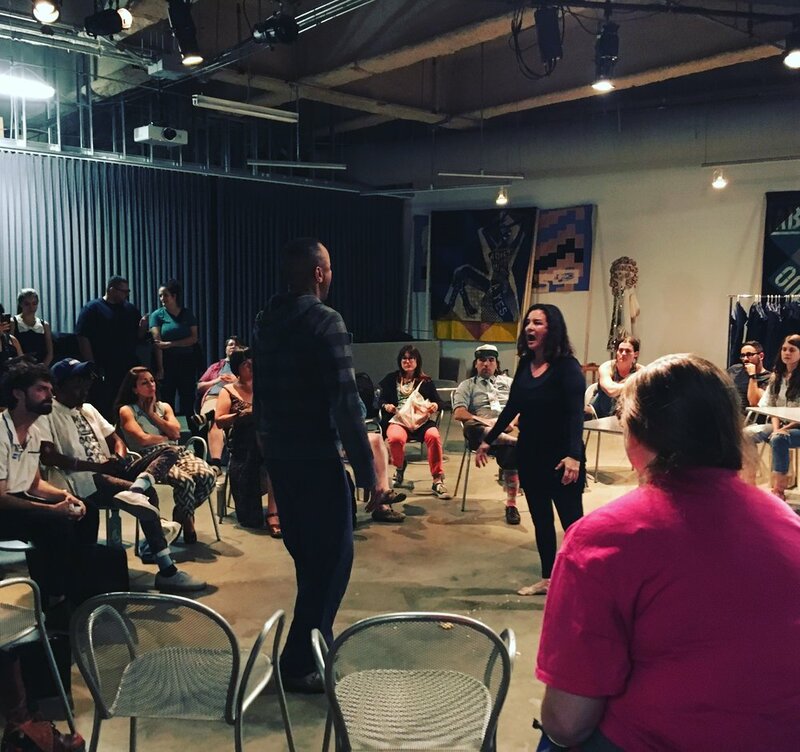 Invited participants (including dancers, performance artists, actors, and spoken word artists) led mini-workshops and engaged in live performance experiments on (and spilling over) the stage. Each day ended with an inclusive performance "encounter." 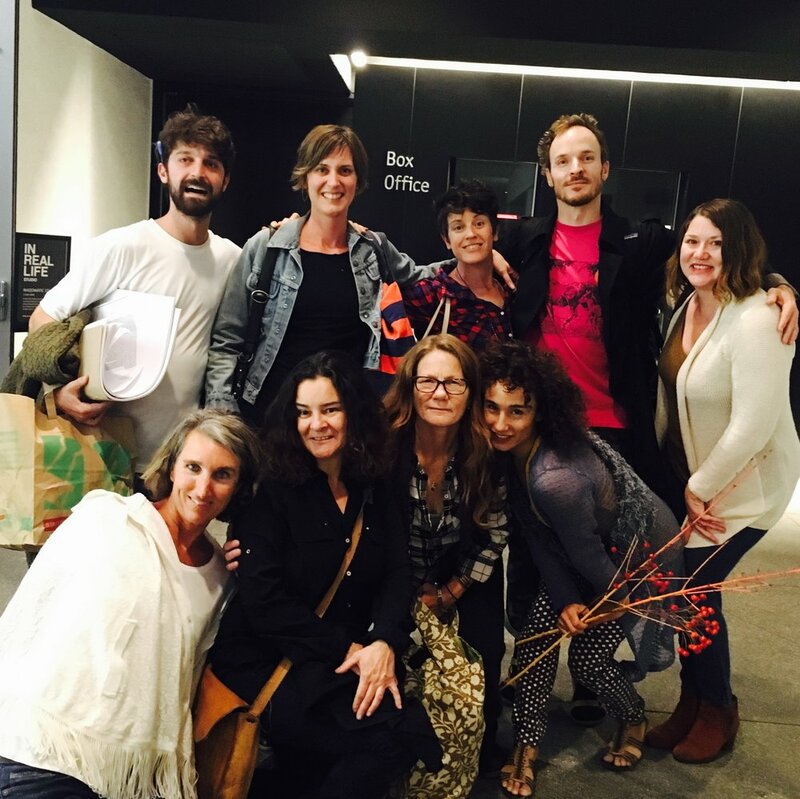 2016 Shared Practice artists: Elisabeth Nails, Carol McDowell, Christy Roberts Berkowitz, Alexx Shilling, Josh Berkowitz, Mariel Carranza, Phillip T. Nails, Marcos Najera, Justin Morrison, and Paul Outlaw. Curated by Allison Wyper, produced by January Parkos Arnall. 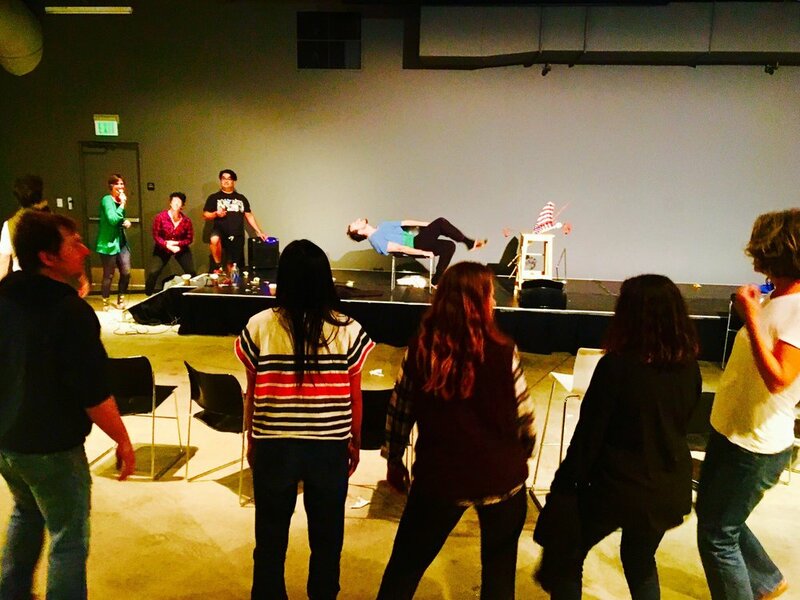 A participatory performance ritual for an age of police violence. Found sound of real U.S. officers, NRA members, politicians, and gun enthusiasts, activated by touch sensors, are embedded in the wombs of the performers: Our Ladies of Peace, vessels of the patriarchy, police brutality madonnas for the 21st century. This collaboration combines performance artist Allison Wyper's work with vulnerability and participation, with media artist Erika Katrina Barbosa's interrogation of police violence through the objects officers carry. A performance, pilgrimage/peregrinación, and walking tour that traces La Zanja Madre, the original aqueduct around which the Puebla of Los Angeles was built, and which remains today a memory of the original heart line of the city, from the east end of Los Angeles State Historic Park to Olvera Street. Carrying an aluminum washing tub reminiscent of those used for laundry when La Zanja was an open-air ditch, I will perform bathing/washing “rituals” at various points along our journey. Bathing my body, my clothes, the feet of my audience of “pilgrims”, and/or historically evocative artifacts (such as photos of the dead from the 1871 Chinese Massacre), we will bear witness to the histories embedded and embodied in La Zanja. These bathing actions will gesture toward a cleansing or purification, redressing particularly painful aspects of Los Angeles’ social histories with regard to racial segregation, violence, and land annexation. Contact me about a project.